In a partnership with the Madison Metropolitan School District, UW–Madison is making strides in showing high school students the opportunities they have for post-secondary education. The university has joined in MMSD’s Personalized Pathways initiative — a program launched last fall for ninth grade students from Madison East, Madison West, La Follette and Memorial high schools — which groups students into smaller learning communities focused on curriculum and careers in the health services field. UW-Madison recently offered campus tours centered on health services to more than 400 high school students. The tours explored the many academic and professional opportunities within the pathway and showed students that college is an attainable goal, says Leslie Orrantia, the university’s director of community relations. “By demonstrating that some of the university’s values link back to the students’ curriculum and their day-to-day experiences, we can complement that relationship and build a greater perceived access to institutions like UW–Madison and to higher education in general,” she says. The tours also served as a way to develop college readiness in high schoolers, something Todd Reck, manager for student experience in the university’s Division of Enrollment Management, says may help to further close existing socioeconomic achievement gaps. During the visits, the Office of Admissions and Office of Student Financial Aid presented information on ways to prepare and pay for college, as well as the college application and admissions process. 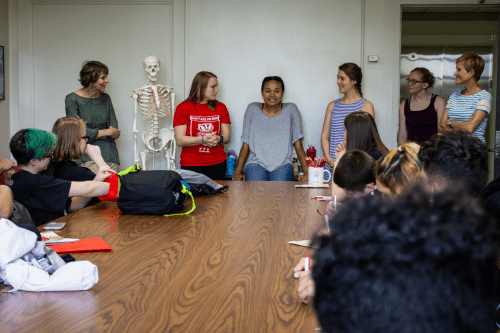 Participants were also introduced to student life and campus facilities by student tour guides, offering the high schoolers an opportunity to ask questions of actual college students. In keeping with the health services theme, groups learned about various careers and research opportunities in the field. Among the six buildings they visited around campus were the School of Nursing, the Primate Research Center and the Department of Physical Therapy. This ultimately played a role in motivating the high schoolers to “explore where they can take a health science career in the future,” Reck says. According to Orrantia, the partnership benefits both the school district and the university. She says reaching out to local communities of color within MMSD ensures that UW–Madison continues to grow and diversify its student population. The university’s Personalized Pathway partnership with MMSD will continue throughout the summer as well. Starting next week, local high schoolers will participate in paid health services internships at UW–Madison.